Utility surveys are vital for land owners, developers and their consultants to determine the location, routes and depths of utility networks, cables, pipes and other buried infrastructure. Siteline conducts a comprehensive utility detection and mapping service that traces, identifies and records underground services for use in feasibility studies as well as the design, construction and management of utility assets and networks. Our results are accurate and proven to allow for more competitive project tenders, reducing the potential for contract delays and the cost of digging speculative holes, whilst mitigating against cable strike and the associated financial risk. 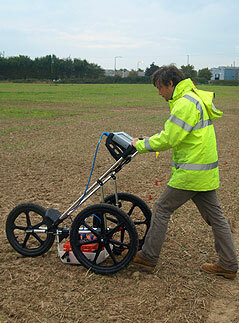 Utility surveys are usually provided as an integral part of an enhanced topographical survey but can also be provided as an independent site mark-out service.